Sleep Apnea Appliances | South Hamilton, MA | Dano Dental Arts Armida Dano, D.M.D. This new, innovative device adds another dimension to oral-appliance therapy. Stimulating protrusive tongue reflexes and an open anterior design advances the tongue and enlarges the cross-sectional area of the airway. Combined with mandible advancement, it becomes the most effective appliance available. Two-part construction allows patients to talk, drink, open wide and close their lips, making this the most comfortable appliance available. With The Moses®, it is not necessary to extend the mandible to a position that is uncomfortable and painful for the patient. The design promotes the activation of the involuntary subconscious reflexes using a clever but simple design in the mandibular lingual acrylic that advances the tongue. Now that the tongue is out of the airway, the mandible does not need to be protruded significantly. As a result, it will also reduce problems associated with TMD. Research discovered that we can activate involuntary subconscious reflexes using this design in the mandible. So, rather than pull the tongue out of the airway, the appliance guides it out. There is nothing in the mouth that restricts the tongue from advancing forward. The Moses® increases tongue space and prevents collapse of tongue on the airway.Of course the open anterior design is part of the solution. The most important dimension of The Moses® is compliance. If the device works well and is comfortable, we know the patient will want to wear it every night. This is key to any treatment involving a removable appliance. As we know from the CPAP; if you don't use it, it can't help. The patient can easily open wide and close their lips and no longer have the discomfort of dry mouth in the mornings. It also eliminates the claustrophobic locked jaw. The combination of the two dimensions of The Moses® means the success doesn’t rely heavily on one attribute to stop symptoms. Since the tongue is already stimulated to a forward position, we don’t have to extend the mandible far in order stop snoring or reduce the AHI. 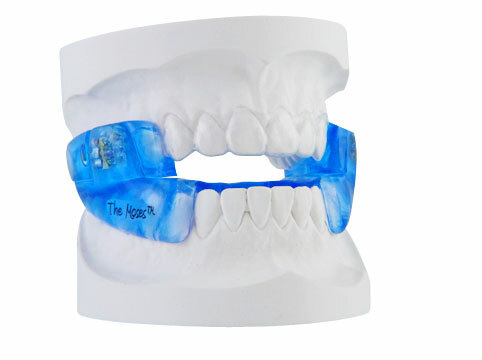 The mandible position of The Moses® is comfortable for the patient. Bottom line: It works and is very comfortable, therefore the patient wears it and gets help every night!